I decided that the hard plastic baby sets we had used in the past few months were just not holding up very well in the dishwasher and were starting to crack a very tiny bit in certain spots. We needed something a little more dishwasher tolerable, and very kiddie safe...as my little man now discovered he loved to eat outside on the front porch!! Well, guess what we still have a few of the originals to this day.....yes, we have lost a few forks, a knife or two, and only have 4 bowls left, but they held up very well!! In fact since we were running low on forks we went back to Ikea just recently to re-purchase some more of everything!! I know my daughter has been eyeing up those colorful forks her brother has been eating with...and it is only a matter of time until she can have a try at them too!!! She will be so excited, let me just tell you!!! 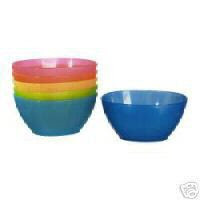 So, bottom line, if you are in the search for toddlerware....give Ikea a try...if nothing else they will definitely add color to your dinner table!!!! Now I have an excuse to visit Ikea!!! Just last night I had to throw out my son's Dora the Explorer plate that I got a garage sale for .25cents. It has seen better days! Meghan wait to see how much fun your son has there...it's so totally kid-friendly!! !